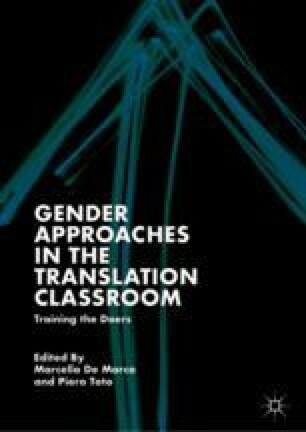 This chapter presents a classroom experience aimed at the development of queer critical consciousness in the translation classroom. Framing the translation activity under Foucaultian power dynamics, students are exposed to the social and political contradictions in the mainstream discourses, thus fostering the self-perception of translators as active, emancipated inter-linguistic agents aware of power asymmetries. The project, based on collaborative premises, engages students in social action and applies their translation skills to their surrounding community. Divided in two phases, students work on the translation of the website of a local LGBT+ organization while, in parallel, they reflect on the representation of non-binary identities, together with the translation challenges and ethical concerns they pose. Martínez-Carrasco, R., and L. Frasquet. 2015. Traducció, identitat, subversió. Reflexions cap a una praxi queer de la traducció. Fòrum de Recerca 20: 665–679. http://doi.org/10.6035/ForumRecerca.2015.20.44.